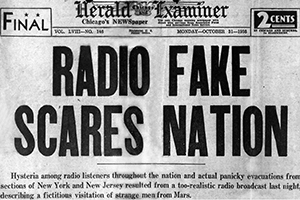 Legend Has It: Prof Shows Fake News a Problem Long Before Facebook | American University Washington D.C.
Orson Welles' radio broadcast "The War of the Worlds" did not set off widespread panic throughout the country. W. Joseph Campbell debunks this and other myths in his updated book. Photo: Courtesy of the National Archives. Oh, did you hear the one about Walter Cronkite ending the Vietnam War? How about fearless Washington Post scribes Bob Woodward and Carl Bernstein bringing down Richard Nixon? You probably are familiar with these stories because they’ve proliferated in the media for many years. But like many a great story, they’re a bit too good to be true. These are among the tall tales that American University School of Communication Professor W. Joseph Campbell refutes in his book, Getting It Wrong: Debunking the Greatest Myths in American Journalism. The book, originally published in 2010, details the origins and propagations of these enduring falsehoods. Questions about fake news and media accuracy are not new, and Campbell has now published a timely, 2017 version of Getting It Wrong with three new chapters. “If our understanding of the news media is to be perceptive and astute, then it is important to get beyond the myths and the distortions they present. There is, after all, scant value in standing idly by while the past is romanticized and misrepresented,” writes Campbell in the new preface. In a new chapter, Campbell examines the Vietnam War photo The Terror of War, more commonly known as Napalm Girl. The disturbing image seemingly captured the brutality of the war and the immorality of American involvement in it. Yet there’s a huge misconception about what the girl in this photo is fleeing. The errant napalm bombing was carried out by the South Vietnamese—not the Americans. Campbell also notes that this photo’s impact on public opinion is vastly overstated. Cover art of the updated edition of "Getting It Wrong," by AU School of Communication professor W. Joseph Campbell. In another new chapter, Campbell takes aim at the popular myth surrounding the first John F. Kennedy-Richard Nixon presidential debate in 1960. It’s a tale that’s found its way into news stories, museum websites, and textbooks. The story goes like this: TV watchers thought the handsome Kennedy won the debate, while most radio listeners—not seeing Nixon’s haggard appearance—gave the edge to the vice president. In the first-ever televised presidential debate, it purportedly exemplified the power of the still-young medium. Jefferson Library staff members at Monticello say the quote hasn’t been found in any of his writings, and there are no known instances of him smoking hemp. Therein lies one way that Campbell assesses potential inaccuracy. If something doesn’t seem right, or doesn’t pass what journalists call the “sniff test,” it’s worth probing. Campbell has looked into old news stories that, while seemingly strange or implausible, have turned out to be true. But in other instances, the sniff test led to important debunking. In his February 1968 report on Vietnam, Walter Cronkite declared, “To say that we are mired in stalemate seems the only realistic, yet unsatisfactory, conclusion.” That actually happened. Yet the oft-cited response by President Lyndon Johnson—“If I’ve lost Cronkite, I’ve lost Middle America”—is apocryphal, Campbell says. Based on LBJ’s schedule, he could not have seen the program when it aired, and he was giving rousing pro-war speeches around the same time. That Cronkite’s words ushered in a sea change in public opinion is belied by polling data, which showed support for the war had already been dropping. This is where Campbell applied the sniff test. As with the Cronkite story, some myths exaggerate the influence of the so-called Fourth Estate. Movies like All the President’s Men and Good Night, and Good Luck inflate the role of these dogged truth-seekers in the public imagination. The complicated Watergate scandal involved a special prosecutor, Congress, and the crucial discovery of the White House audio tapes. Woodward and Bernstein did strong reporting, Campbell says, but they were not responsible for Nixon’s undoing. Edward R. Murrow—despite what’s insinuated in Good Night, and Good Luck—was late to the party in denouncing red-baiting Senator Joe McCarthy. In the early months of Donald Trump’s presidency, Campbell says the stakes are even higher for journalists to do their jobs well. Trump is already waging a war against the media, yelling out “fake news!” over any story he doesn’t like. Mistakes weaken reporters’ credibility, which gives Trump more ammunition to attack legitimate, fact-based criticism. “It’s incumbent upon the news media to be even more vigilant, and really make sure of the accuracy of their stories. And I’m afraid that that is not an obligation they’re fulfilling very well these days,” says Campbell, a veteran journalist before joining the AU faculty in 1997. He says he’s already seen too many mistakes in recent months, including a Washington Post article that Russian hackers penetrated the U.S. electric grid, and a Time report (which the Trump administration jumped all over) that Martin Luther King’s bust had been removed from the Oval Office. Both of those reports were corrected, but Campbell worries that erroneous stories can spread so quickly in the digital age. Getting it right is paramount, lest new media myths take hold.